I did not forget you, but as usual… no time to write. Not long time ago I got from one friend in soap swap an all natural cocoa soap with raw cocoa beans, which I really LOVED! Well… I could not make the very same soap, as I was visiting my parents and had only olive oil to work with, not to mention there was only a bit of the cocoa powder. 380 g distilled water – prior to adding NaOH I dissolved in 2 teaspoons of sugar (for nice foam) and 1 TBSP of salt (so that it is not slimmy). 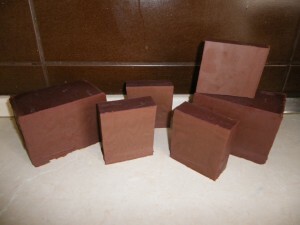 Notice, how the soap changed its color at the top to much lighter color while curing. The next day – exactly 12 hours after pouring – it was very interesting to follow the soap “transpiration”. 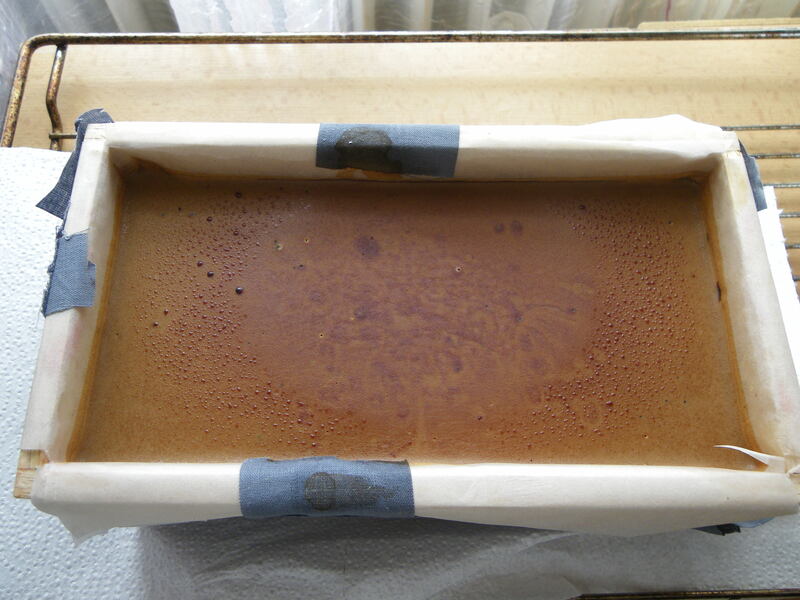 Small droplets of water and glycerine appeared on the top, in the very middle of the soap mold, where the gel phase started. I noticed another very interesting feature of this soap. After a month of curing, I cut it and found the middle to be softer and lighter in comparison to the edges from which the water evaporated. After two weeks, the difference of colors faded (the middle became darker), however not perfectly. The second choice is better as it distributes the mica in a much more uniform pattern. Soap well and let me know if you try (tried) something similar! 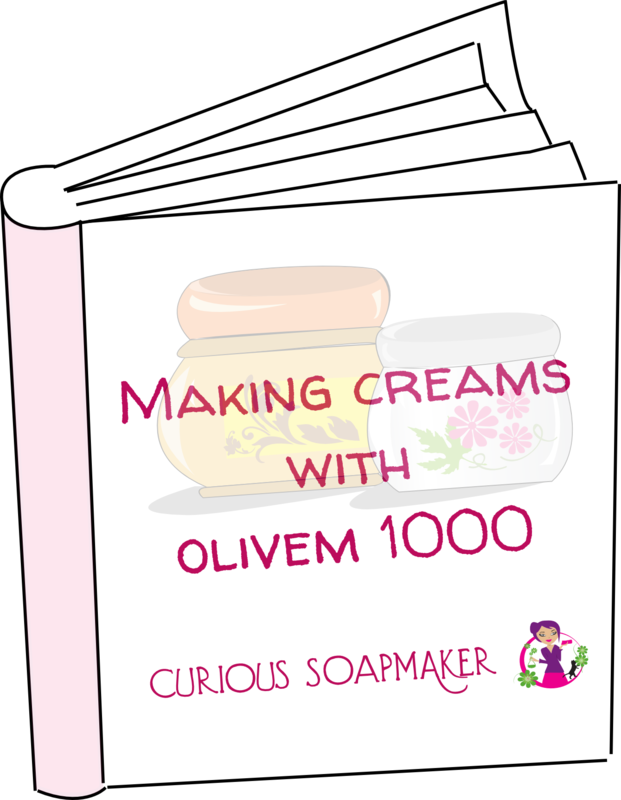 This entry was posted by evik on July 7, 2013 at 00:13, and is filed under soap recipes, soap tips & tricks, soapmaking. Follow any responses to this post through RSS 2.0.You can leave a response or trackback from your own site. Hi! 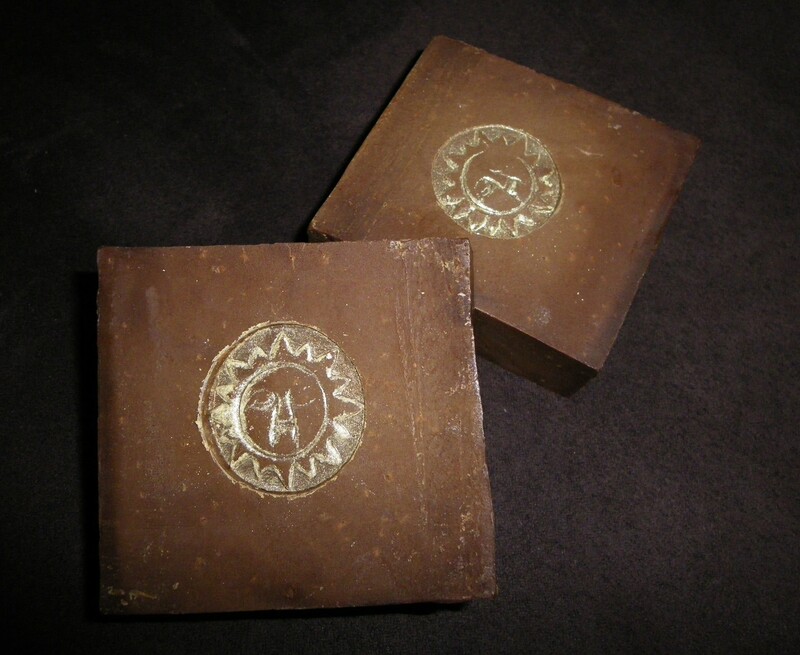 It’s amazing…I’ve been planning to make a cocoa 100% olive oil soap for weeks, AND I just got some gold mica and practice soap stamps. Thanks for the sugar and alt tip. 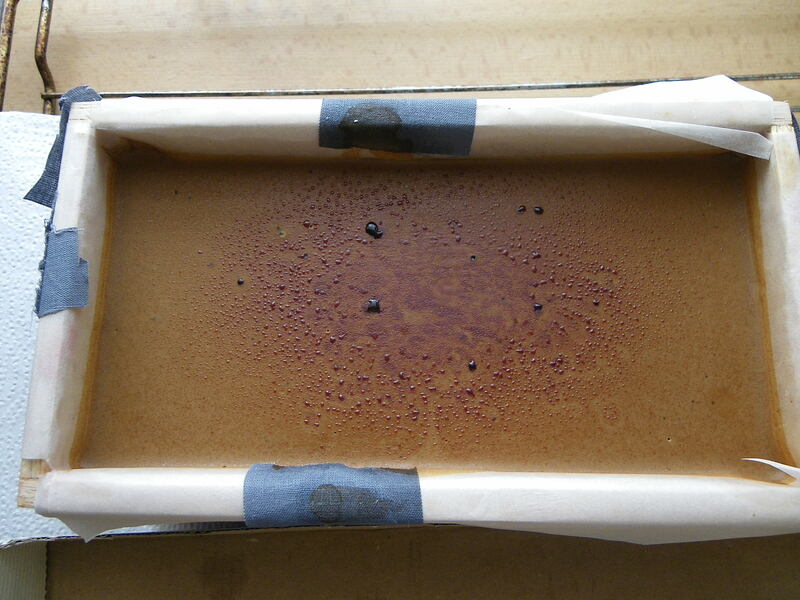 I did the other way and ended up with a lump of caramel in my lye solution…lol. 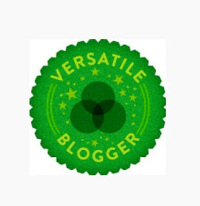 Good work on your blog, I’m signing up after posting this comment. 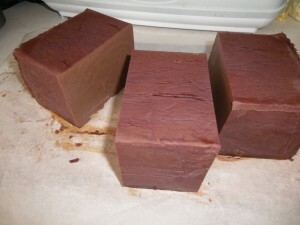 HOW DID THE SOAP LATHER AND FEEL AFTER CURING??? 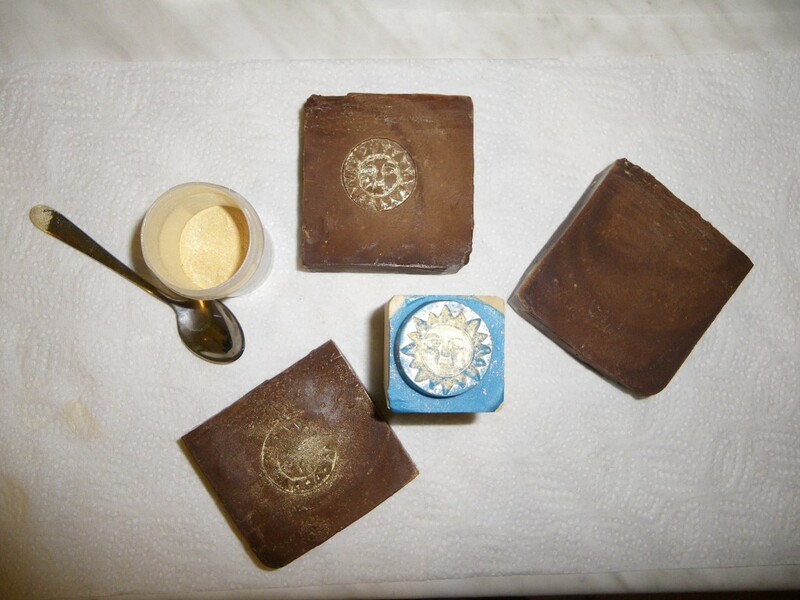 I am ver curius why the colour and texture change happen in the middle of the soap. Does anyone know? I keep having this with my soaps as well. Even with individual silicone molds. As I am giving some smaller pieces of soap away for trial, I cut some of the individual bars later and I am often surprised to see the middle of the bar being darker, just like on the pictre and being softer/having differetn texture. Altough, after a couple of days the couor and texture becomes almost even It might has something to do with the gel pahse, but somehow I do not think so. Does anybody know the reson. It is not only colour difference, but the inside is much softer. I’d appreacite if someone know the answer. Is this a bad thing? 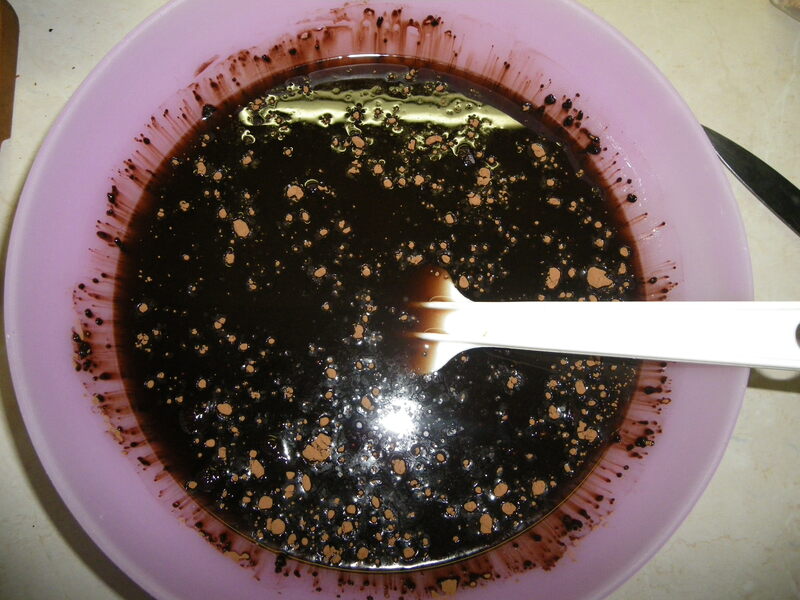 Hi Marcsi, I later understood that this is due to the water evaporating from the surface, which darkens the color and hardens the soap! Hi Evik! Thank you for you reply! So it is not a bad thing after all. I am wondering why it does not happen to all the batches then? Do you think that the formulation of this “crust” could somehow prevent the water evaporating form the inside (once it formulates)? Hi Marcsi, I think it is normal – water first evaporates from the surface and only then from the inside. The crust probably plays its role, too, but not sure how big a role it is. 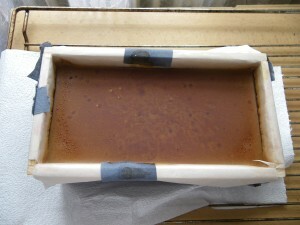 I believe if you leave soap long enough, the water will eventually evaporate anyhow from the whole soap bar. Hi Evik! Thank you for your reply and for sharing this again! 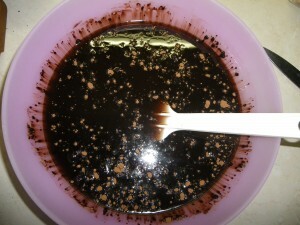 Hello Evik, I have been follwing your blog for a few months now and tried several of your recipes. Thank you for all the interesting information you publish. 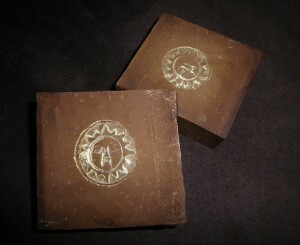 With this soap I had the problem of it crumbling on me. 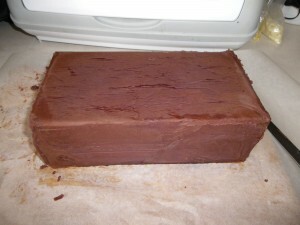 When I cutted it after being two days in the mould it would break badly on the edges. Hi Nanitta! 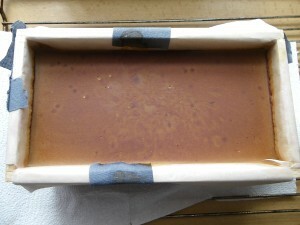 Crumbling on the edges means your soap was too cold on the edges – therefore it did not saponify as fast as the rest of soap which was warmer inside. It means it is still too “raw” to be cut (on the edges). 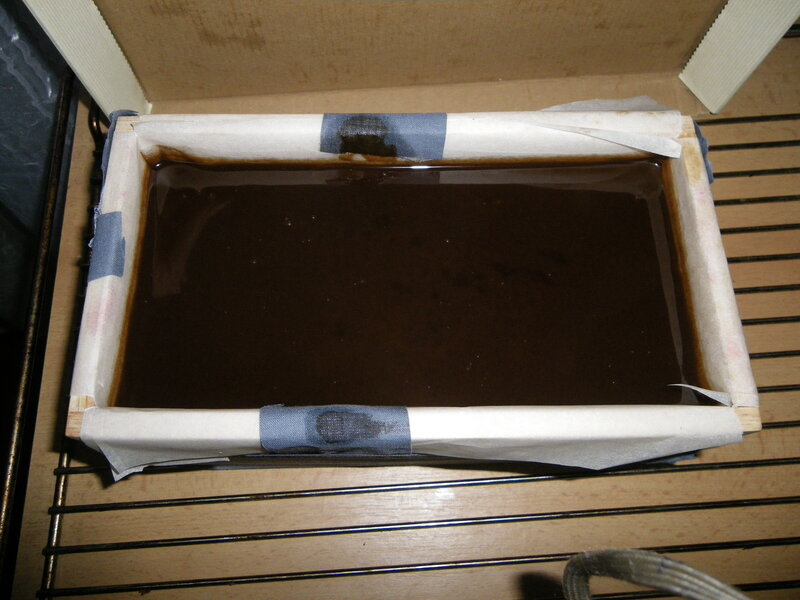 It happens if you use moulds with thin walls, which are not able to insulate well and the heat from the reaction goes into the surroundings. It would be even worse if you had one in the fridge. 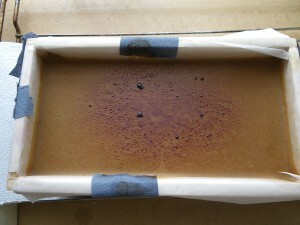 This is certainly not a recipe to put in the fridge, since the saponification reaction is slow enough due to olive oil. The cooling does not help it at all! 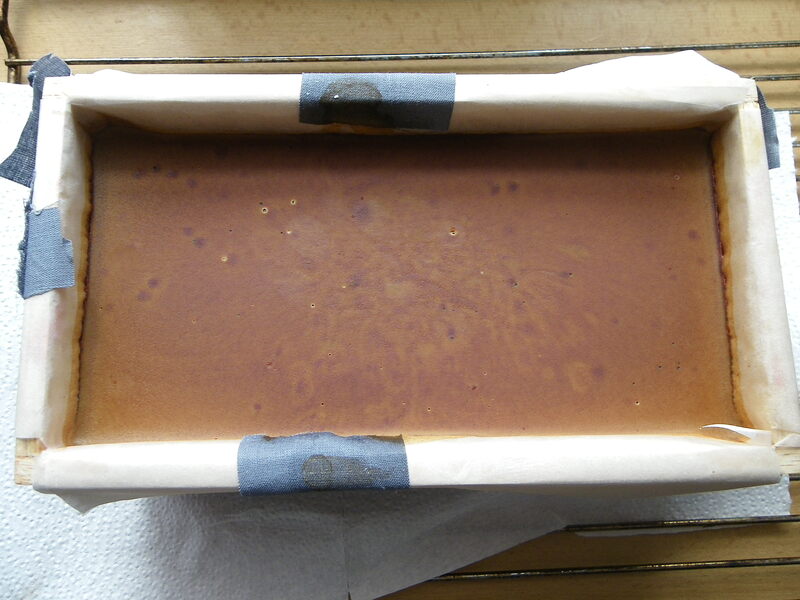 So the solution is – leave it in the mould some more, or put it close to some heat source – beware, it will gel and your soap will get liquid, therefore do not heat individual soap bars. If you already cut it, just leave it as is, it will saponify, although it may take longer than usual. For the next time, make sure the soap gels (insulate well your mould or use a wooden one, put it on a radriator or close to heat source), or if you don’t want it gelled, just leave it 3-4 days in the mould. Hope this helps, soap well! Now I know what I did wrong, I used a silicone mold and covered with a kitchen towel: poor insulation. The one in the fridge…. well, super wrong! It didn’t make sense thinking the salt was the issue… Thank you so much for your reply, you have been of great help!